Last Monday, on the feast of the Annunciation my friend Liz entered the Monastery of the Discalced Carmelites. I’ve known Liz for several years online. We have even sent each other Christmas cards the last few years and one time I called her because a weird guy was trying to talk to her on the bus. I’ve never met Liz “in real life” and I didn’t talk to her privately that much. I remember talking to her privately a few times when I was dating a few crazy guys and I needed someone to tell these INSANE stories to. She commiserated with me and told me I wasn’t crazy and the guys were weird/insane. I knew she had discerned religious life a few years ago but family things happenned and she was young and wasn’t quite ready to make that commitment. She attended the first university I attended several years after I attended (small world). Did a little bit of dating that went nowhere but still felt she was called to become a nun. I witnessed her discern and research several different religious orders before she decided on the discalced carmelites, which is a somewhat cloistered order. They don’t have any internet or cellphones, they rarely leave the grounds but they are allowed to walk around outside, have visitors, and talk to people. I remember when she found out she was going to enter. It was on October 1st the Feast of St. Therese! Who was also a carmelite. I knew that this day was coming. I knew she’d be leaving my internet world. I knew I’d only be able to communicate with her via letters. And we can’t write to her until at least July at that. What I wasn’t expecting to experience last week was the grief, sadness, and lonliness I felt. I was so happy for her but at the same time it was like losing a friend. I was so sad last week when all her social media accounts got deleted. I was so sad when I could no longer hear about her story and her journey. But I was so happy that she had answered Gods call to join the religious life, pray for others and do good in the world. She was SO HAPPY to be joining this particular convent. Every time she posted a picture or talked about it you could just see the joy in her face. I know when the time comes I will be writing to her and can’t wait to hear about her new life but until then I am in this limbo space of sadness and happinness. I pray for her everyday just as she prays for me. 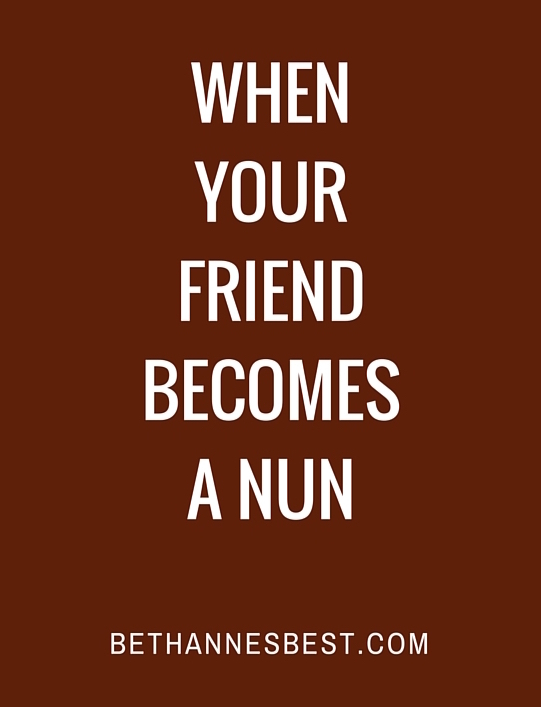 Hae you ever had a good friend enter the priesthood or convent? Or a Cloistered convent. Is there anything you did that helped you miss your friend less? Share your stories with me in the comments! by the mantra “mosquito, its what’s for dinner. They are still partakers in an unconstitutional system turning into a full-blown police state. A wiser person would realize if he were a no show there would be consequences. There’s one guard watching the bathrooms, and it actually seems like a fairly good idea to whip the door open while he’s watching (look at the minimap).